Expressing gratitude not only changes how you feel about your own life, it can improve relationships and make you happier, according to the Harvard Mental Health Letter. At Krimsky Dental, we count our blessings every day. We’re grateful for our wonderful patients and for our wonderful staff members. We’re grateful for the insurance that allows many of our patients to more easily care for their dental health. We’re grateful we can offer sedation dentistry to help our patients who are more anxious when getting dental care. And we’re grateful to live and work in Plantation, FL, a wonderful community in a beautiful state. This time of year is full of reminders about how we can express our gratitude. Veteran’s Day is November 11. We appreciate all the sacrifices our military men and women have already made, and continue to make, to keep our country free. This gratitude extends to military families, who make their own sacrifices. While their loved ones are serving in other locations, they are guarding the home. They move to new locations based on where their military family member is stationed, and they live in constant worry about their loved one’s health and safety. These military members and their families are in our hearts all year, but especially as we celebrate Veteran’s Day. Thanksgiving is another way we express our feelings of gratitude in November. No matter your race or religion, Thanksgiving allows us to celebrate our blessings together. We appreciate our bountiful food, friendships and family connections. Take some time during your Thanksgiving meal to share with others what you’re grateful for. At Krimsky Dental, one way we share our gratitude is through our support of I Care I Cure. Throughout the year we are involved with the planning and execution of the organization’s two main fundraisers of the year, a 5k walk and a Golf Tournament. The I Care I Cure Childhood Cancer Foundation supports the development of, and raises public awareness about, cutting-edge, targeted therapies for childhood cancer, so that the treatment of childhood cancer will be gentler and more tolerable. As this season of sharing and caring begins, think about what you and your family are grateful for, and how you can bless someone else’s life in a meaningful way. It can be as easy as donating food to a food bank, or volunteering time to visit a senior’s home, or getting involved with I Care, I Cure. Perhaps your kids can help you pick out some toys for other children who may not get holiday presents this year otherwise. There are several organizations that support our troops, and you can send cards or packages through Operation Gratitude, A Million Thanks or Adopt a US Soldier. Express your gratitude to your loved ones, but also to those who impact your lives who may not know it. Sharing the impact they have on you can brighten someone’s day. 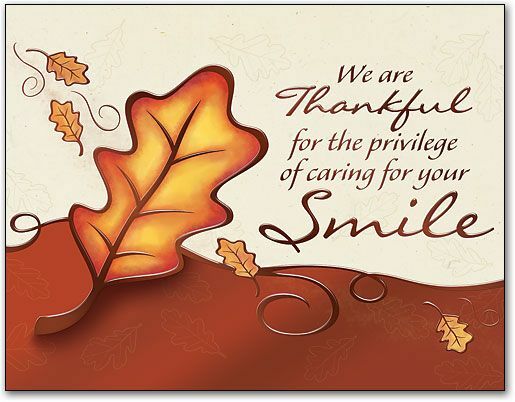 Krimsky Dental is grateful to you and your family for allowing us to be part of your lives. While we may be improving your smiles, know that you make us smile every day as well. For that, we’re incredibly grateful.